Rob Boulware, Stakeholder Relations Manager for Seneca Resources Corporation gave a lecture about how he manages crisis communication in the natural gas industry. He talked about the importance of crisis communication plans. Boulware said “Don’t think you can handle a crisis from afar – you need to be there to feel it, see it and fully understand it.” In his PowerPoint presentation, he showed us a picture of one of his document folders in his computer, the shot showed dozens of prepared crisis plans for events that could happen to the Seneca Corporation. There were plans for the death of an employee, fire situations and more. He explained how his organization did not have crisis communication employees or plans until 2010, two years after the public began to complain about contaminated water due to fracking in Pennsylvania. 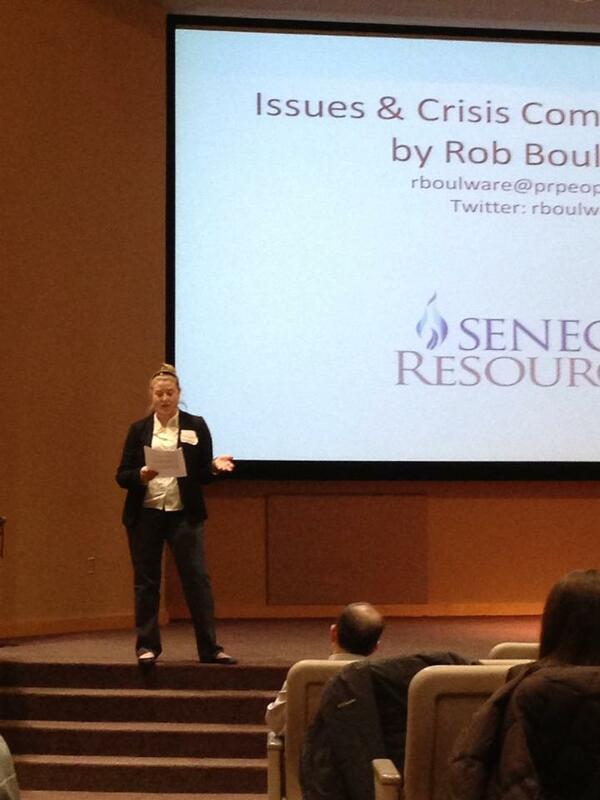 Boulware explained how crisis communication is not for everyone and how it is a big time commitment. “Know your organization’s values” was one of his main focuses in the presentation. He said that using a value statement or mission statement to handle a crisis as well as the people involved is key. He ended the presentation by explaining that crisis situations are never expected and stressed practicing crisis plans with fellow employees as well as creating a relationship with the publics and stakeholders in the areas where crisis may happen.